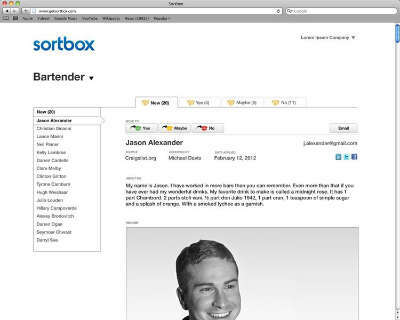 Sortbox, a recently launched web app, allows users to create sortboxes, or inboxes geared specifically to the receipt of resumes. Once the box is created, users can then add information to a handful of fields about the job, like the job title, the job description, and other, more specific, details about the position. Then post the sortbox address online and advertise the sortbox link. Potential hires then visit the sortbox’s associated web page and upload their bios, resume data, images and similar information then just click the “apply” button to send it in. But once they’ve sent it in, the business owner, hiring manager, or whoever’s ultimately in charge of bringing new people into a company, can then visit the sortbox later and see all the information neatly gathered together on one page for easy viewing. Better yet, Sortbox offers three simple colored buttons to use in terms of sorting the whole thing out–a green button labeled “yes”, a yellow button labeled “maybe” and a red button labeled–you guessed it–“no”. Users can then revisit their yes and maybe piles to see who to call in for interviews or otherwise give more consideration. While there are a wide variety of resume sorting apps out there, Sortbox has taken the unusual step of removing features against its more robust competitors in a bid to streamline and simplify the system. The process in turn may make Sortbox less valuable to some, but may also make it valuable to others. Indeed, the closed beta of this release went very well, with just under 50 customers, including startups like wello.co and several others finding it a treat to use. Better yet, Sortbox is currently available on a trial basis at no charge, and is expected to operate under a freemium pricing system in which basic use will be free, but larger numbers of applicants and the like will require payment. 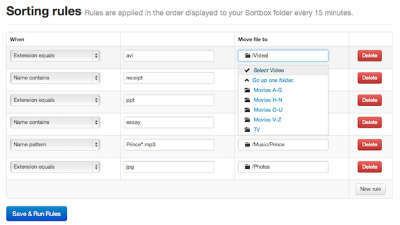 Sortbox is indeed very simple to use and will provide a much better way of organizing applications together than sifting through an email inbox unaided would have provided. Given that this is also at least somewhat free to use, that’s another point in Sortbox’s favor, and makes this a great one to consider when figuring out just who to hire and who to leave behind. While good employees are vital to the successful operation of just about any business, providing easy to use, simple, and cost-effective ways to keep in contact with customers, including cloud-based telephony features like call recording features and digital fax receiving capabilities to help improve customer service and contact capabilities. Sortbox, meanwhile, looks to be a comparatively simple way for small businesses to get the best chance at figuring out who’s best to help a small business build into a bigger one. This entry was posted in Employees, Small Business, Virtual Office by Steve. Bookmark the permalink.